Is this new Santa Cruz Megatower a big wheel Nomad or something completely different? Here’s the low-down and our first ride review thoughts. The Santa Cruz Hightower LT uses their older style VPP configuration, with the shock tucked under the top tube and driven by the upper rocker link. Hard not to love the Santa Cruz Nomad CC. It looks drop dead gorgeous, pedals better than most 140mm bikes but you have 170mm to get you out of trouble. Santa Cruz Bronson has borrowed the Nomad’s new suspension layout, grown fatter wheels and longer geometry. 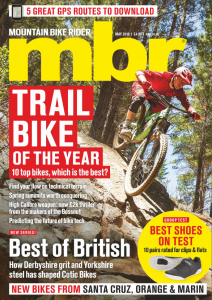 Can it retain its Best Ever Trail Bike status? In lustrous Sriracha red, you can’t failed to be won over by the stunning looks of the Santa Cruz Hightower C. The beauty goes beyond skin deep too. The Santa Cruz Bronson CC is quite possibly the best 150mm travel trail bike we’ve ever tested.